Last month the northern Italian town of Lodi moved to deny the children of non-European citizens the free school meals and school buses provided for “locals.” Mayor Sara Casanova, representing the hard-right Lega, had issued the “reform” last summer, but it only came into effect with the beginning of the 2018–19 school year. Foreign parents are required to meet near-impossible thresholds to prove they do not have income abroad. According to the Corriere della Sera some 318 families are affected; most of the children concerned were born in Italy, but this is no guarantee of citizenship, and it is the parents’ nationality that counts. 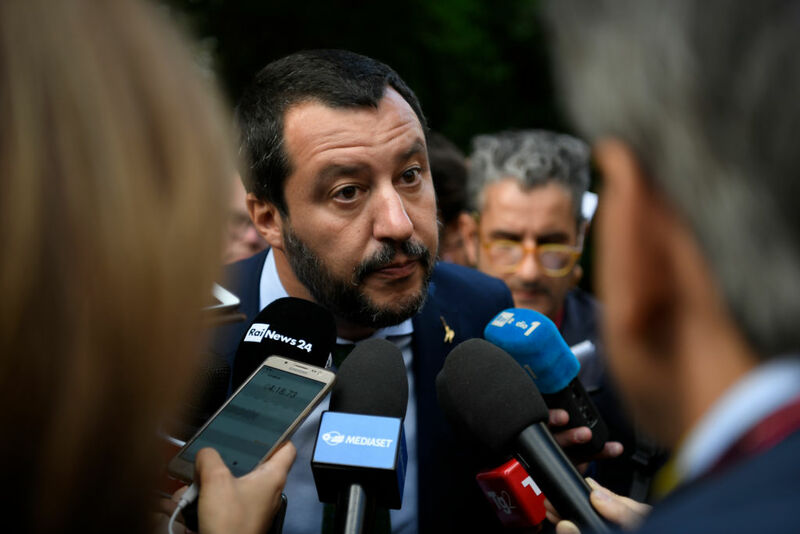 Lega leader Matteo Salvini welcomed the move, falsely suggesting that many of these families had “two, three, or four houses in their own country” and thus ought to pay themselves. Alongside protests by those most directly concerned, €60,000 has been crowdfunded to support the children. If it might seem odd for Salvini (who is both Interior Minister and Deputy Prime Minister) to intervene in local politics, this is nothing compared to his ongoing campaign against the mayor of a village on Italy’s Southern toe. Since 2004, isolated Riace (population 2,300), led by Domenico Lucano, has played host to thousands of migrants, becoming a “model” of integration based on jobs and training while also revitalizing an abandoned village. But after Salvini’s months-long war of words with Lucano, on October 2 the mayor was placed under house arrest, under accusation of “aiding and abetting illegal immigration.” Matteo Salvini publicly welcomed the arrest by saying it “would serve as an example for others” while also vowing to dismantle the Riace model. Salvini’s Lega is today becoming both more repressive and increasingly hegemonic. Its coalition partner the Five Star Movement (which has almost twice as many seats in parliament) has reacted feebly to each new move by the Interior Minister and appears even to be bleeding support to the Lega. After collapsing to 4 percent in the previous general election, in this March’s vote the Lega topped 17 percent and now enjoys the support of around a third of the electorate. But most of all, it has dominated the Right, swallowing up the base of Silvio Berlusconi’s Forza Italia (since 1994 the main right-wing party, in its various incarnations) as it also extends its reach beyond its own heartlands. Having taken over the Lega Nord (Northern League) in late 2013, Salvini set off to conquer Southern regions where the party had never before stood candidates. In towns where only five years ago Salvini’s party defined the locals as terroni, a racialized term of abuse against Southerners considered akin to “Albanians” or “Moroccans,” it is now combining a new reactionary common sense with an older conservative base. Having risen from zero to high single figures in Southern regions at the general election seven months ago, the Lega is now polling 22 percent in the bottom half of Italy that stretches from Abruzzo to Sicily. Yet this is no uniform picture: the Lega vote remains wealthier and older than the general population; in the South, it is winning more support off other right-wing parties than from the Five Star Movement, an eclectic force which enjoys particularly strong backing among white-collar workers and the unemployed. Rather, the Lega’s success lies in its ability to pull traditionally reactionary forces behind its own banner, in a new nationalist bloc. If in March’s election it stood together with Berlusconi’s party and the post-fascist Fratelli d’Italia, these parties did not then join it in government, and today Salvini is using his command of the national political stage to sap these former allies’ strength. We may doubt the sincerity with which the Lega has abandoned its Northern chauvinism; the coalition deal it signed with the Five Star Movement in June near-silenced this latter party’s call for the regeneration of Italy’s Southern regions. But the Lega is no longer confined to just one part of Italy; in power, it is able to offer the scraps to draw Southern political bosses, entrepreneurs, and even simple crooks into its own orbit. The oldest party represented in parliament (it was founded in 1991), the Lega Nord from the outset strongly promoted the politics of giustizialismo, a war against corruption and criminality in the Italian state. This theme came to the center of Italian politics in the “clean hands” trials of 1992–1994, which destroyed the historic Christian-Democratic and Socialist parties. Yet embezzlement accusations would also fell the Lega’s founding leader Umberto Bossi, who was in 2012 forced to resign because of a police investigation which ultimately led to his conviction. Over summer 2018 the €48.9 million bill for the Lega which resulted from Bossi’s misuse of public funds had seemed likely to force Salvini to create a new party from scratch. However, a legal deal reached in September allowed the Lega to pay the sum back in 489 installments by the year 2100. Notwithstanding his own troubles with the courts, Salvini has also made giustizialismo the cutting edge of his attacks on Riace’s mayor Domenico Lucano. Boosted by a 2014 scandal over the mafia takeover of the tenders for migrant reception centers, Salvini has constantly presented all and any initiatives to help refugees as part of a racket designed to cheat state coffers. Such rhetoric is today echoed by the hard-right Interior Minister’s coalition partner; after Lucano’s arrest, and the announcement that funding for migrant reception would be cut off, Salvini’s undersecretary Carlo Sibilia (Five Star) wrote a blog entitled “Riace was no model: time’s up for the immigration business.” If a handful of Five Star figures not in government (such as parliamentary speaker Roberto Fico) do defend immigrants, this direct combination of anti-corruption and anti-immigration politics has always been a potent ingredient in the movement’s brew. Beyond invoking Lucano’s supposed abuse of office, Salvini called for the money devoted to migrant reception instead to be devoted to increased police numbers. Yet even policing has its political uses. Upon Lucano’s arrest many social media users asked why the Interior Minister was so concerned about this left-wing mayor of one small village rather than the ‘Ndrangheta mafiosi who run rampant in this Calabria region. Salvini only confirmed their point six days later as his Facebook profile shared a video by a “concerned citizen” of Riace opposed to welcoming migrants; the citizen concerned had in fact been arrested in 2011 on suspicion of mafia ties. In August, during a period of increased scrutiny over farm bosses after the death of twelve Gambian, Ghanaian, and Malian migrants packed into a van, Salvini explicitly stated that the blame was not to be attached to caporalato, a black-market hiring system known for its €2-per-hour wages and massive tax evasion. Despite occasional accusations of vote-buying made during the election campaign, notably in Naples’s Scampia district, it would be a vast exaggeration to suggest that the Lega’s base in the far south is dependent on organized crime. It has, instead, succeeded in cohering behind itself more legitimate networks of power, as well as parts of the activist base of right-wing and far-right parties of older vintage. A recent article by Susanna Turco in l’Espresso detailed its recycling of the former personnel of not just Forza Italia but post-fascist movements like the defunct Alleanza Nazionale and Destra Sociale, entering the newly forming Southern structures of the “Lega Salvini.” Indeed, while during Berlusconi’s initial rise in the mid-1990s he allied with the Lega in the North and the Alleanza Nazionale in the South (they made no pact with each other, given the regional-sectarian tension between them), today all these forces increasingly meld into Salvini’s party. Beyond the recycling of old personnel is the social agenda of the Lega, whose aggressive privatizing thrust has at least some friends even in the poorest parts of Italy. The party has promised to radically cut tax for the wealthiest, even having stepped back somewhat from its pre-election promise of a 15 percent flat income tax rate for all Italians. Indeed, if the Five Star Movement won many Southern votes on the promise of a “guaranteed income” (actual proposals fall far short of this promise), its coalition partner is instead promoting a more classically neoliberal agenda, albeit one also compatible with the interests of firms interested in access to government contracts. At the same time, a “pro-business” and giustizialista agenda can also be confected with a racist one. On Thursday, Salvini issued a Facebook post insisting on a “9pm closing time for little ethnic shops that become a hangout for drug dealers and troublemakers.” In Italy, twenty-four-hour supermarkets are relatively rare but there is a steady rise in the numbers of late-night convenience stores owned by foreign nationals, in particular from Bangladesh. Only 30 percent of all Italian businesses are in the South, but the figure is 42 percent if those owned by non-EU citizens are included. And while the Lega has a weak vote among the very upper echelons of Italian society, it is on stronger ground among Italian small businessmen. If much blame can be placed on the center-left Democratic Party in preparing the way for the rise of the populist right, the Lega vote is not just the “left-behind.” Ever less of these latter vote for the Democrats, today fourth-placed among blue-collar workers (13.9 percent in March, according to pollster SWG’s estimates). But in the general election, at least, this category also heavily favored the Five Star Movement (38.6 percent) over the Lega (23.8 percent), whereas the gap was far narrower among small businessmen and the self-employed (among whom Five Star held a 31.8 percent to 23.6 percent lead over the Lega). Having overtaken Forza Italia to become the main party of the Right, the Lega sees its happiest hunting grounds among these latter groups, as it seeks to build a base in the South. Few political forces represent a “Southern” interest in the manner that the Lega insists on greater fiscal autonomy for its own Northern heartlands. Naples’s left-wing mayor Luigi de Magistris is a partial (if mainly rhetorical) exception; in recent weeks he has voiced a kind of Southern pride and called for greater autonomy for his city (and even an extra local currency) as he battles the central state over funding. However, Southern hopes particularly ride on the Five Star Movement, whose vote here in March was so strong that in some regions it scored an absolute majority of votes, notwithstanding Italy’s highly fragmented party system. There is at least some truth to the claim that the Five Star-Lega lash-up, as they reached a deal for government in June, was an encounter between two different populisms, the one more based on the young, the poor, and the South and the other on wealthier, Northern voters. Yet at the same time, the Lega has also eaten into what were the heartlands of the Christian Democratic party. In the South, too, it is finding a conservative base receptive to its message and not turned off by its racial animus in the manner of left-wing voters and the bulk of the professional classes. Whoever voted for Silvio Berlusconi will have little trouble with Salvini’s harsh rhetoric. Today the once-derided Southerners have not, in the main, turned to Salvini and his Lega. Some, at least, remember the insults against the “lazy” and “corrupt.” Others do not vote for the Lega because they still believe in the promises Five Star has made: a job, an income, some prospect of renewal. But for those in the South who already have power, the invitation to join a national hard-right force is only too welcome. For the political fixers, for the tax-evaders, and indeed some even shadier interests, Salvini could not have come soon enough.